Silver kettles first appeared at the end of the 17th century and served to replenish empty teapots, which were small at this time. To keep the water hot, they were supplied with stands fitted with a spirit burner that warmed the underside of the kettle, allowing the silver to act as a heat conductor. The handles were usually made of wicker or wood, or with ivory disk inserts that provided insulation from the boiling water. Due to the weight of a full kettle, they were often positioned next to the tea table on a stand and used with the assistance of a servant. 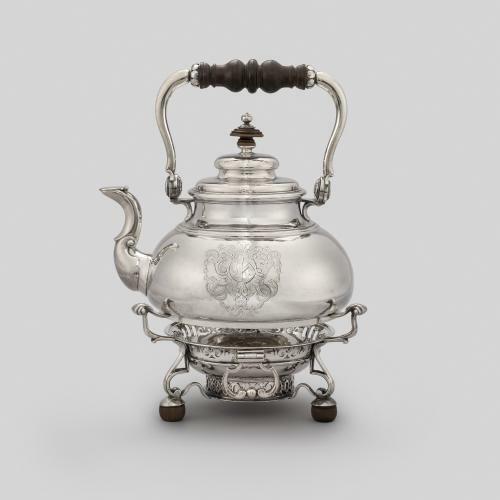 As such a large and impressive silver item, kettles became a focal point of the tea ceremony and an obvious expression of wealth. 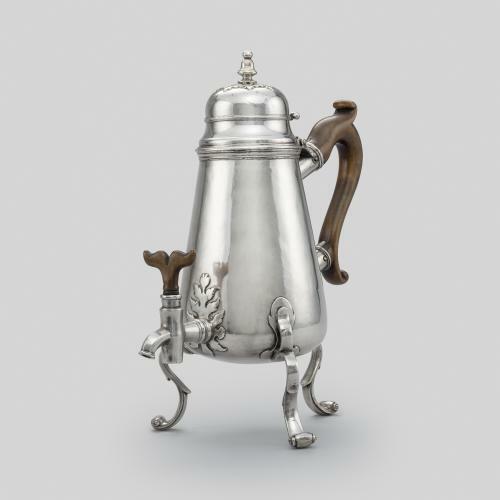 The maker of this kettle and stand, Simon Pantin, was a celebrated Huguenot silversmith whose parents came from Rouen. He was active during the first decades of the 18th century and produced items for a number of influential patrons. This kettle was made shortly after Pantin entered his first mark in 1701. 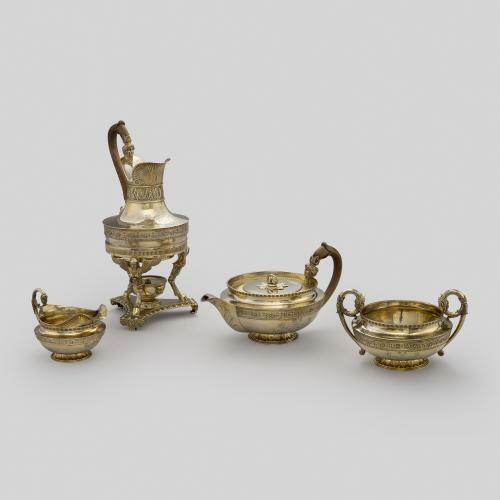 Pear-shaped kettles and teapots had begun to appear in English silver design by the late 17th century and remained fashionable until the 1720s. On early examples, such as this, the stand often has hinged handles to make it easier to carry. Early English silver is often plain and of simple form, decorated with only a family coat of arms or crest. The decorative piercing on the burner stand, however, reflects the stylistic influence of the French Huguenots on Pantin’s work. The body and the lid on this kettle are engraved with a coat of arms and the crest of Tanand impaling Chardin of the Inner Temple, London.